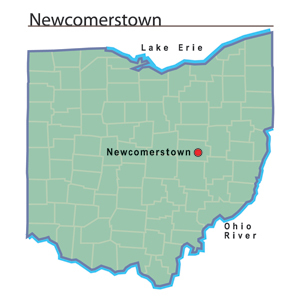 Newcomerstown began as a small village east of modern-day Coshocton. In 1750, Christopher Gist reported that a small number of English colonists nearby. Among them was Thomas Burney, a blacksmith. Burney made a living providing local natives, especially the Delaware Indians, and English and French trappers engaged in the fur trade, with products in return for furs. No later than the 1760s, Delaware chief Newcomer constructed a native village. The native name of Newcomerstown was Gekelmukpechunk, although white settlers and traders named it Newcomerstown after the Delaware chieftain. It quickly grew to become the largest Delaware village on the Tuscarawas River. By 1771, more than one hundred dwellings had been built. In 1776, more than seven hundred Delawares and a handful of whites called the town home. Newcomerstown declined in importance during the American Revolution, as the Delaware Indians began to consolidate in villages closer to Coshocton.